These items are made to order, please contact me with your request and size. Ready to ship items are under the STORE tab. 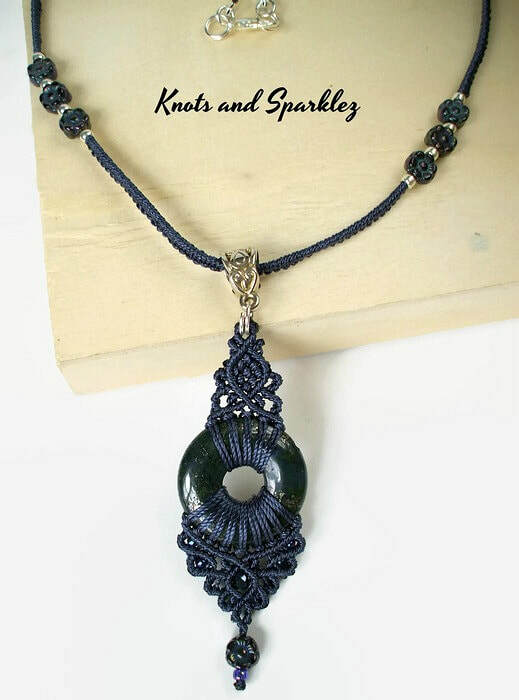 This is my latest necklace in Navy blue and Silver with a Donut center bead. Light weight and classy. 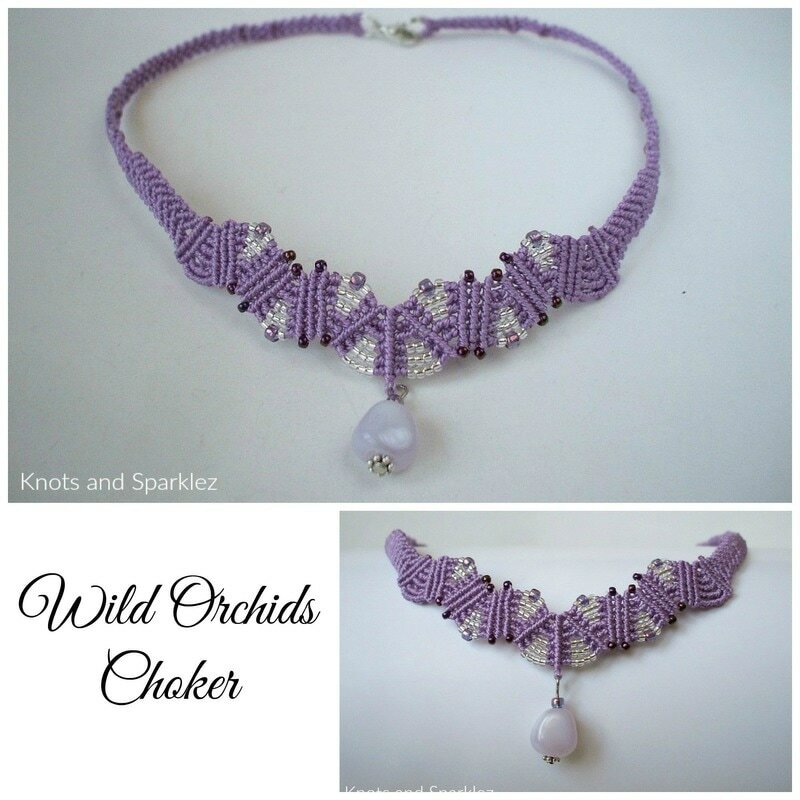 Another one of my latest necklaces this on in Heather color with an Amethyst pendant and a leaf pattern. 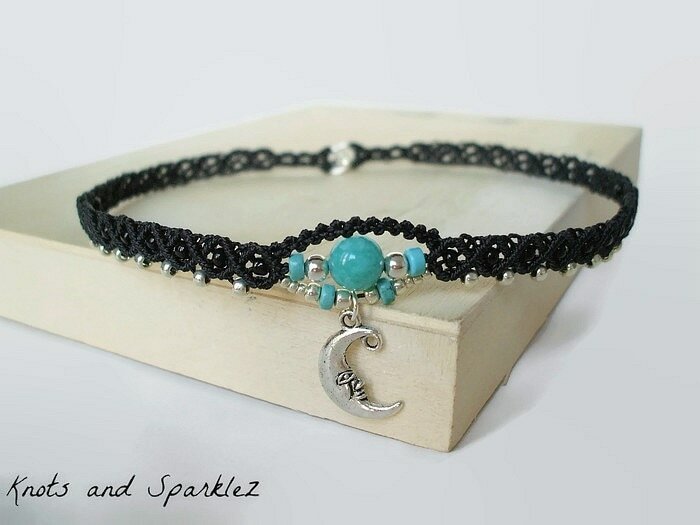 Amazonite central bead with turquoise and silver accents beads and a crescent moon pendant for a touch of mistique. 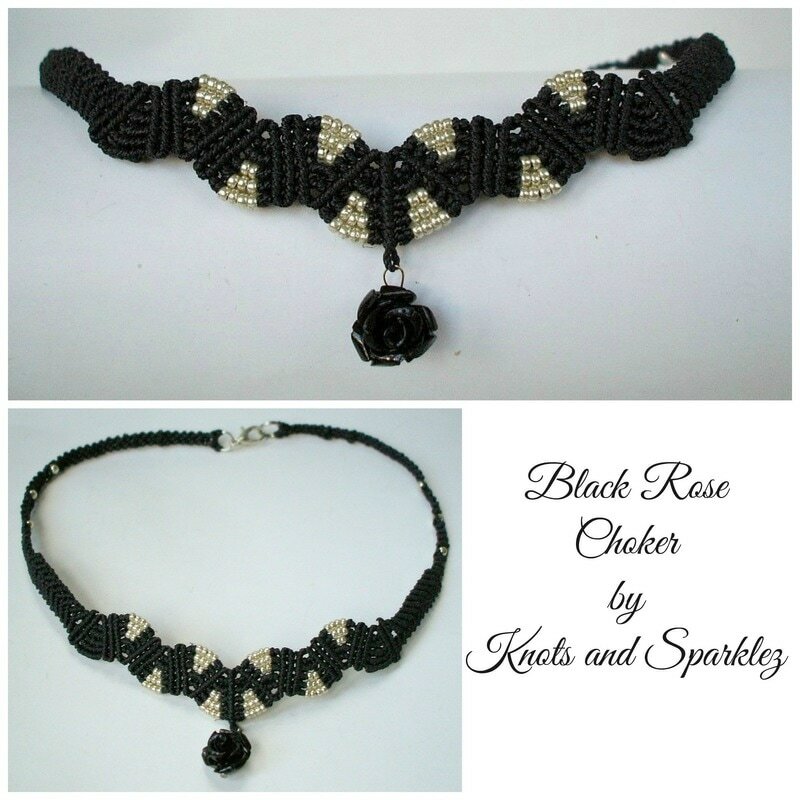 Black cords around the neck embellished with silver and black beads in a lacy style pattern. 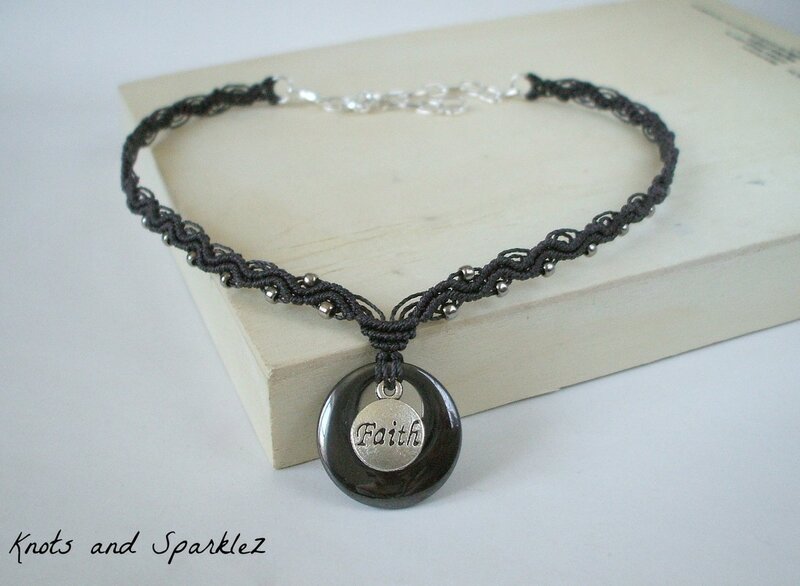 A wavy pattern interspersed with nickel toned beads with an Hematite pendant layered with a Faith charm in silver tone. Very easy to pair up with your outfits, great for church services, and religious events. Can be made in any size you need. 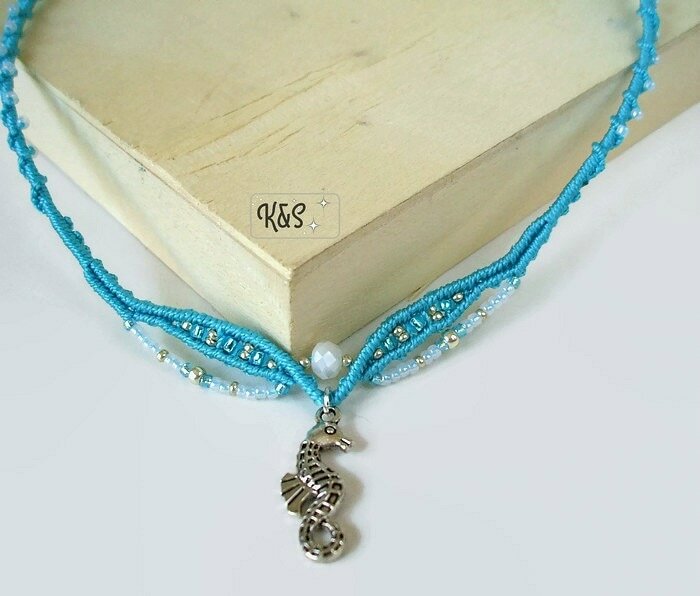 Turquoise cords with shimmery beads in silver, turquoise and milky white with a central faceted bead and a Seahorse pendant. This is the perfect Spring/Summer Accessory!! Can be adjusted to fit any size you need. A fan shaped pendant in pastel rainbow colors is freely swinging from this matching necklace in pastel colors with neck work in Vanilla tones. It is shaped so that it might resemble a bird in flight or a ballerina, let your imagination inspire you. Can fit any size as needed. 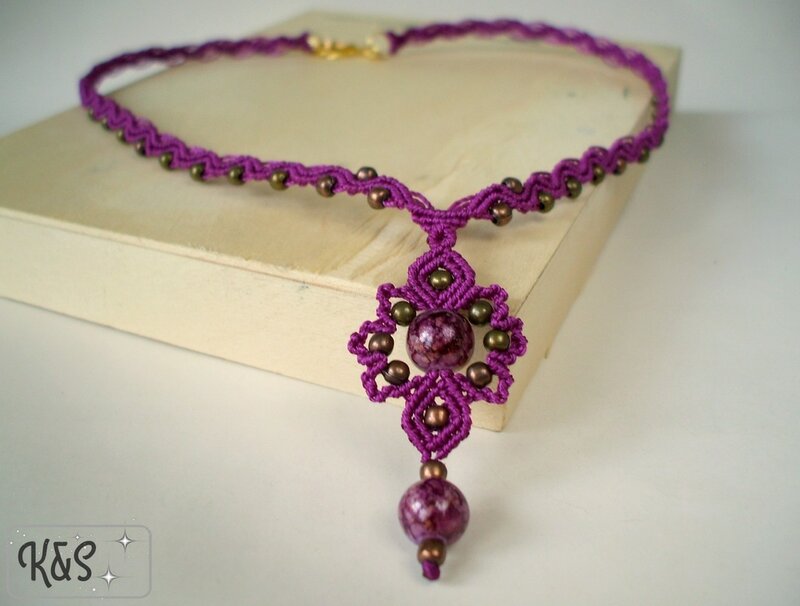 Hand knotted necklace in purple/plum color with bronze metallic beads and marbled glass beads for the flower shaped pendant. 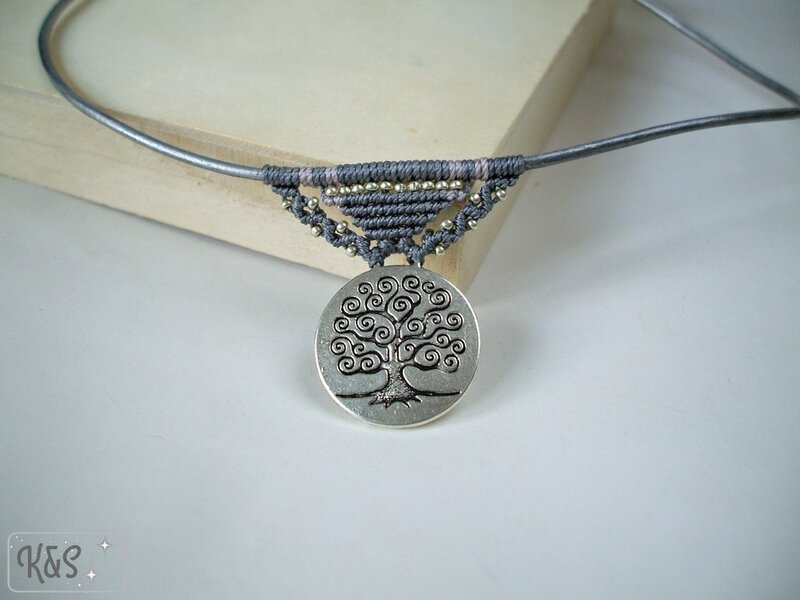 Choker necklace hand knotted on gray leather cord with 2 shades of gray and silver beads with a Tree of Life pendant as a focal point. The Tree of Life is a mystical and magical Tree well known throughout many cultures dating back to ancient times. They all have similar meanings as the source of Life in each culture. 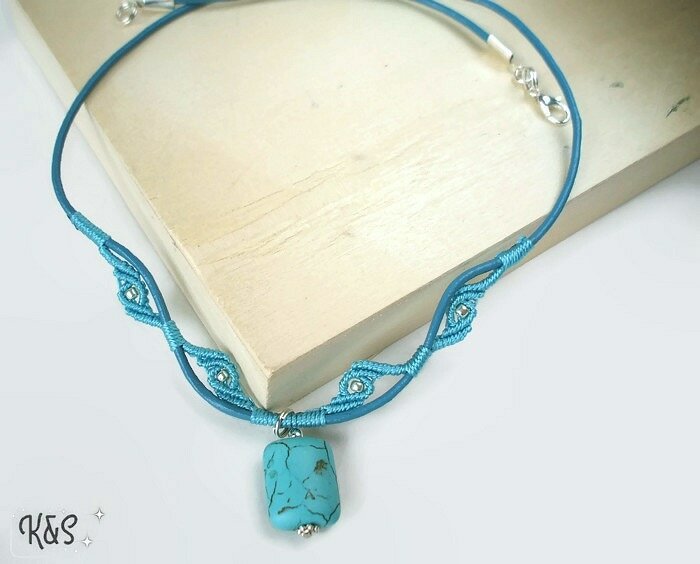 Knotted on Turquoise leather cord in swirly pattern this necklace features a turquoise stone pendant, possibly Howlite and silver accents. A unique piece, my own design. 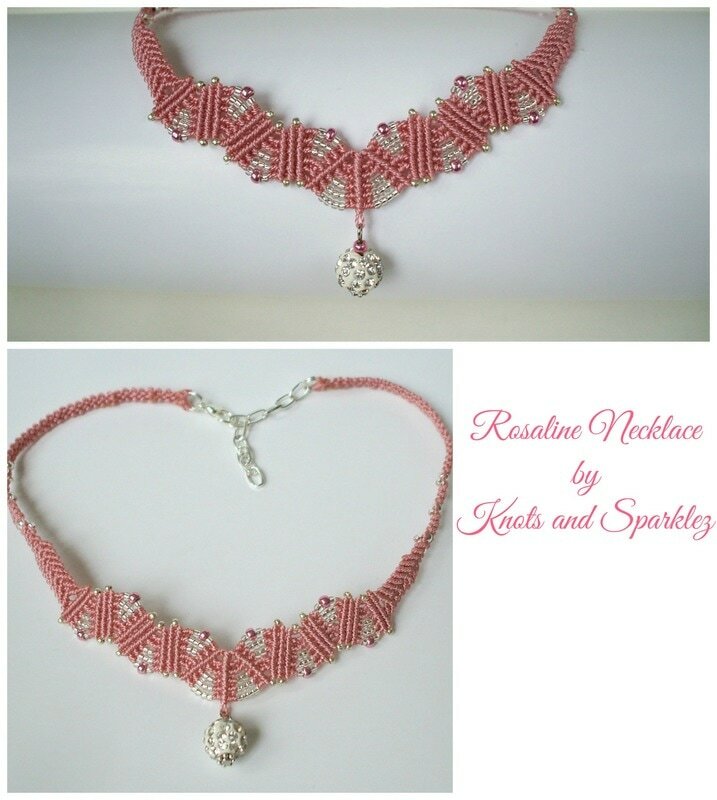 Choker Necklace in pink/magenta colors with silver accents and a tridimensional flower glass pendant. Very light weight and feminine. 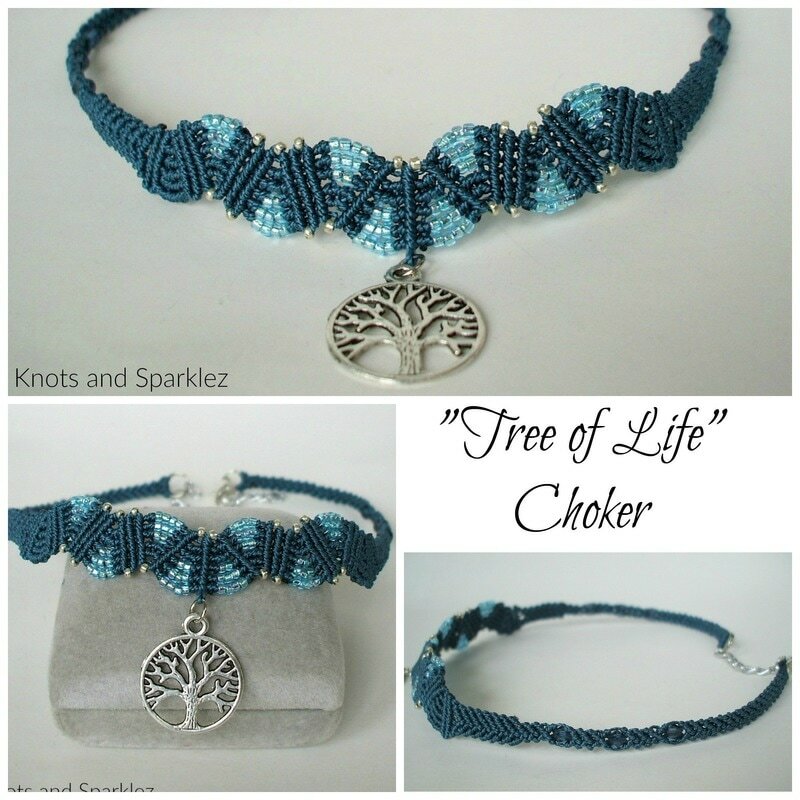 I love the meaning and the symbolism of the Tree of Life and wanted to incorporate it in one of my necklaces, this was the perfect opportunity. The peacock blue of the cords and turquoise of the beads complement the look so well. 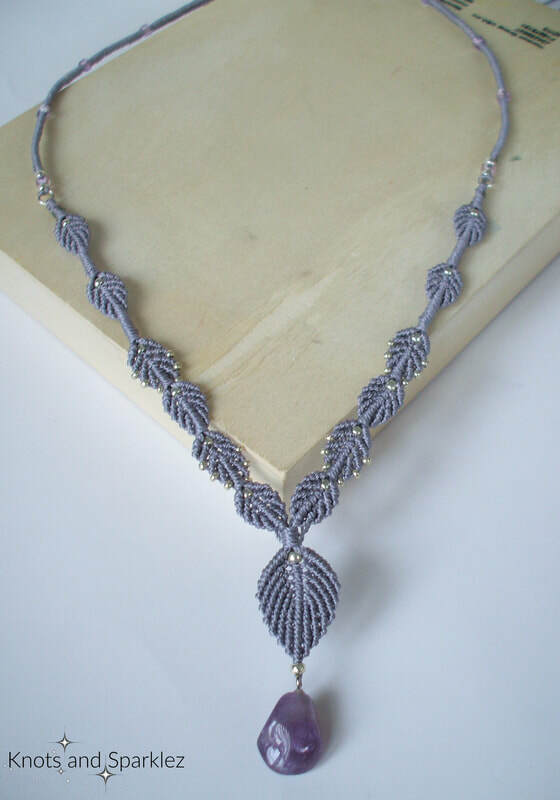 This is a very light weight piece and very versatile, it can be dressed up or down. For the Black version I chose to switch the pendant and add a Black Rose which created a totally different look. This is more Romantic Gothic in black and silver and would look great with everyday black denim outfits but also with a corset, or lacy outfits. Again very versatile and lightweight. These are more elegant and feminine versions in lighter colors or orchid and rose, I chose different pendants as one needed more sparkle for a fancy event while the other needed to match a more somber outfit. The rose one has its matching earrings shown in the earrings section. 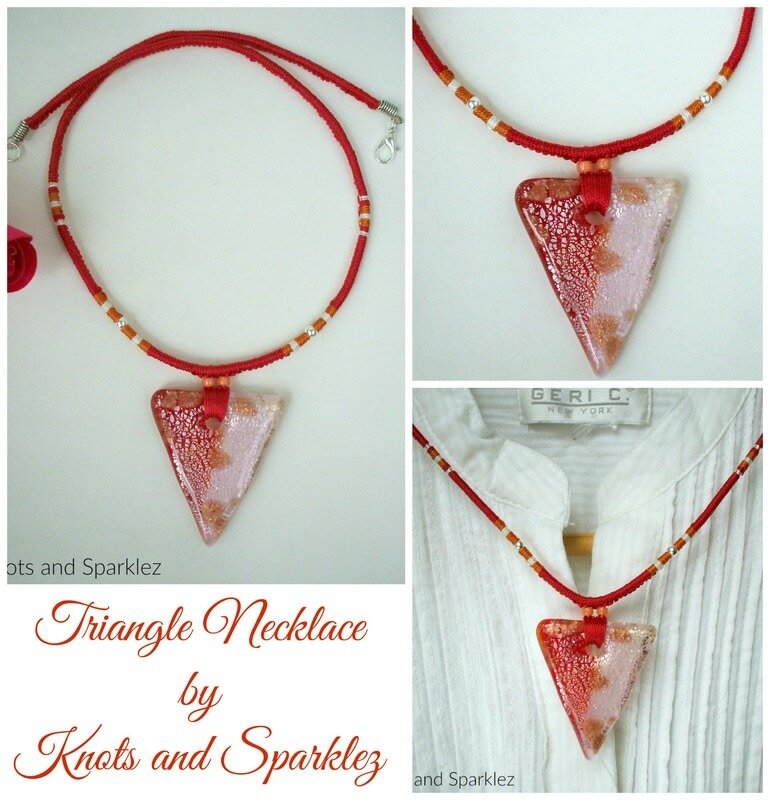 These are short necklaces worn at the base of the neck.